The first of November 2017 was the official launch date for multiple London installations of David McDiarmid’s digital art works. 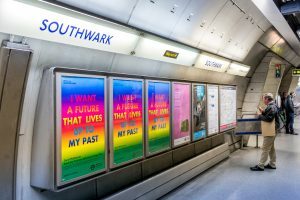 The ‘Rainbow Aphorisms’ – a series of digital works created by McDiarmid between 1993-1995 – will appear at sites across the London Underground network and throughout Clapham in South London. The project has been initiated by Joe Scotland, Director and Laura Harford, Curator from Studio Voltaire working in partnership with Jessica Vaughan, Curator for Art on The Underground. Sally Gray has worked with Studio Voltaire and Art on the Underground to manage the Sydney end of the project on behalf of the David McDiarmid creative legacy. The project is supported by Studio Voltaire, London Underground and This is Clapham BID. It coincides with events throughout Britain in 2017 commemorating the 1967 partial decriminalization of male homosexual acts. More on the London Rainbow Aphorism Project and the David McDiarmid legacy. David McDiarmid, from the Rainbow Aphorism series, 1994, Image courtesy the David McDiarmid Estate, Sydney, Art on the Underground and Studio Voltaire.